This lithograph is taken from plate 27 of 'General Views of Lucknow' by Sir DS Dodgson. This site was originally laid out as a garden by Nawab Asaf-ud-daulah, who transferred the capital of Avadh from Faizabad to Lucknow in 1775. His successor was Saadat Ali Khan (1798-1814) who constructed a building in a corner of the garden. It was designed by the talented Frenchman Claude Martin, along the lines of an English country seat, and named Musa Bagh after the biblical Moses. 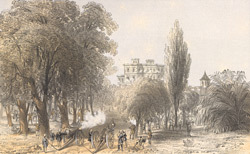 During the revolt of 1857-58, the Musa Bagh saw continuous action. The Begum of Avadh made it her headquarters in March 1858, and it became the last position in the city held in force by the Indians. The Begum's 10-year-old son had been declared Nawab of Avadh by the rebels in July 1857. British troops under Outram and Campbell eventually captured Musa Bagh. The Begum escaped to Nepal where she was granted asylum.